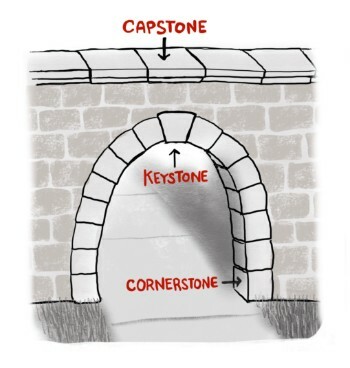 Just as a real capstone is held aloft by the building blocks beneath it, the SEM Capstone is built on four years of learning and growth, and stands proudly at the highest point of the structure that a student has built stone by stone. Every SEM senior completes this self-directed independent project, guided by the prospectus but with CAPSTONE mentors. From its inception, the Capstone program's purpose has been to bridge the high school and college experiences, providing a space for seniors to stretch themselves beyond what they have already accomplished. The skills students develop and practice through SEM's Capstone projects align, by design, with the characteristics that colleges seek in applicants. These same skills and mindsets lead to success in college and beyond. The Capstone program both informs and reflects SEM's academic program, which intentionally scaffolds students' growth in the college-preparatory areas of research, academic writing, intellectual independence, and self-management. During the trimester-long Junior Capstone course, each junior narrows down a research question under the guidance of a team of faculty mentors. With the support of mentors and a small group of peers with related interests, juniors conduct preliminary research and develop a prospectus, or plan of action, for the projects they will complete senior year. It has been amazing to see the students bring their plans to fruition. In the past, when they've done internships, it's to get an experience in the community, but now we're seeing students reach out into the community for experiences that truly inform their inquiry. There’s a moment where you really see the light bulb go on, and you can see they're just completely inspired from within. Capstone Faculty: Kris Kemmis, Director of Operations and Capstone Community Liaison; Jennifer Goetz-Bixby, Science faculty and math/sciences mentor, Sharon Kounovsky, Academic Dean and Capstone Coordinator; Carey Miller, History faculty and humanities mentor; Benjamin Joplin, English faculty and humanities mentor. Front row: Gabriela Lyons, Languages department faculty and language and culture mentor; Caitlin Cass, Fine Arts faculty and arts mentor; Beth Lewitzky, school librarian, Research & Information Literacy teacher, and Capstone research librarian. I discovered my college major because of Capstone! The Case of Mary Bell: Punishments in China vs. the U.S.